Sydney is a migration city. From the first British convicts and their carers, to the recent influx of Mainland Chinese and Eastern Europeans, each group brought their culinary finest and memories of home with them. Unlike the Chinese and Tex-Mex restaurants in US, these are authentic renditions of hometown favourites. One of the most exportable tastes, which with little tweeks will allow the locals to accept them wholeheartedly is Thai food. Spicy, sour, savoury, sweet – these flavours can appear on the same dish without any shyness about them. And the best examples are not found in posh nosh restaurants but in street cafes and hole-in-the-wall eateries. This was one of the finest I found in recent time. Located in an area called Little Thailand, just off Chinatown precinct in Sydney downtown, Yok Yor was quite easily spotted as it was always crowded with people – theatre goers after their classy Broadway musical dressed in their nines mingled with young couples just coming from their classes in the nearby campus. The eclectic mix of people spilled into the streets that reminded you of a typical Thai Soi. We came here with friends from Israel and thought we gave her an introduction to Thai cuisine. We ordered the quintessential Som Tum (Thai green papaya salad with lemongrass and tamarind dressing), Tom Yun Goong (Lemongrass and spicy prawn soup) and Gang Phed Ped Yang (Red roasted duck curry) and Pad Kana Moo Krob (Stir fried Kailan with Crispy Pork Belly). Most of these were adjusted to local Ang Moh tastes – less spicy and sour than the usual Thai standards. The red curry was outstanding with the hints of lychee fruits and good balance of spicy and lemak (coconut milk). The kailan was outstanding as well because of the pieces of pork fat cracklings that were thrown in for good measure at our requests. 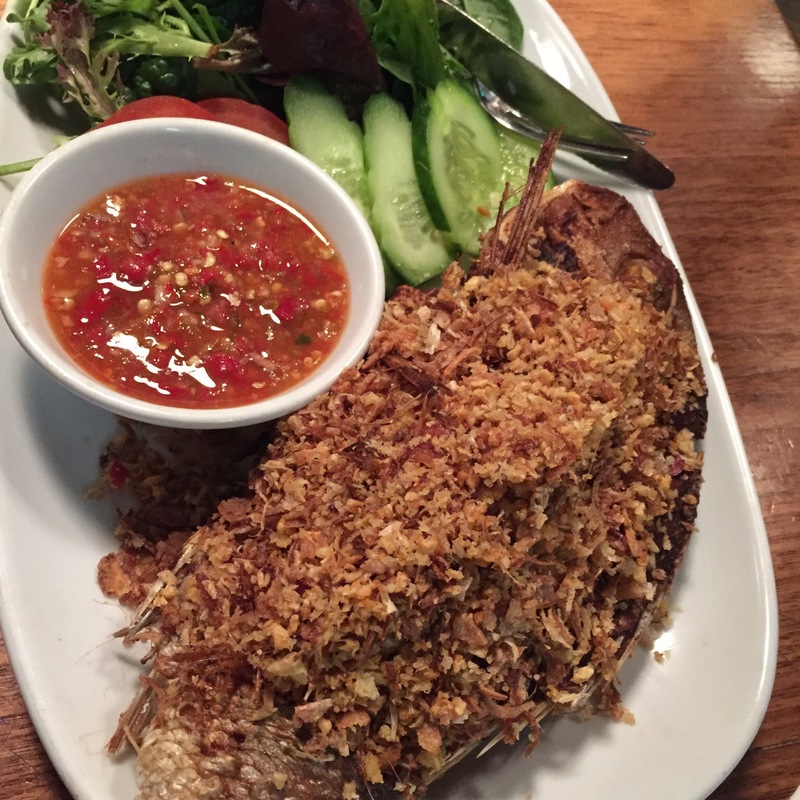 Play Tod Takrai or Deep fried whole snapper sprinkled with lots of crispy lemongrass, Thai herbs and spices served with chilli lime Nahm Jim, was quite good. But it was not served like in Thailand where it was butterfly-cut and deep-fried so they came out looking like a bird soaring. This one was more like home cooked style, deep fried as a whole fish and served. I guess due to the space we have in the tiny shop, you cannot be too flamboyant with plating and presentation. 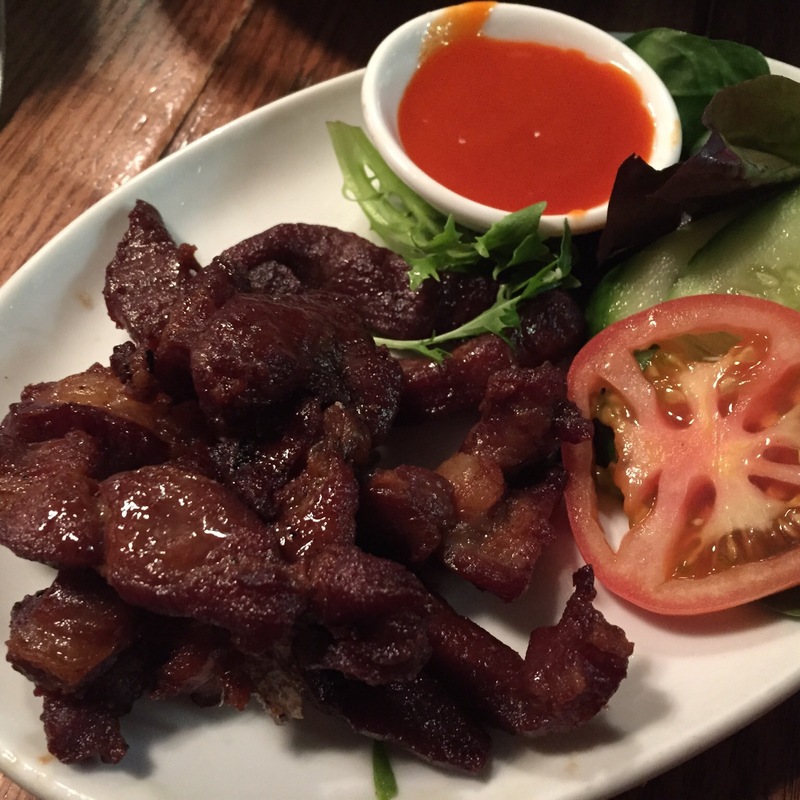 Moo Dad Deaw, or Fried homemade sun dried sweet and salty pork served with Thai chilli sauce, was an Ihsan classic. There was a very heavy Ihsan influence in the food they served, so I guessed the chefs must be from that region in Thailand. Ihsan food are very rustic in nature and are served with natural flavours and seasonings, using everything they can get. This dish used strips of pork that are sun-dried (an ageing process not unsimilar to the ageing of good beef) and that marinated in a soy and fish sauce and spice marinate, then BBQed. Very good with ice cold beer, and I recommend Singha no less. But it was the noodle dishes that I have to recommend highly. 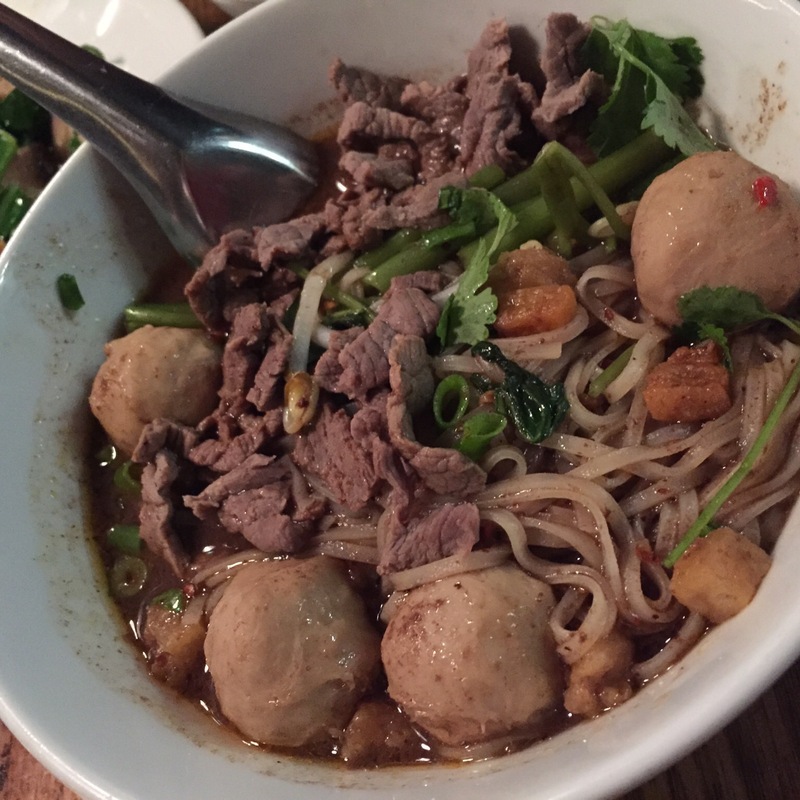 A Thai traditional favourite noodle soup, Kuay Teaw Rua featured sliced beef, beef balls and pieces of tendons in a slight sweet, very savoury beef broth. Talking about bovril overload. 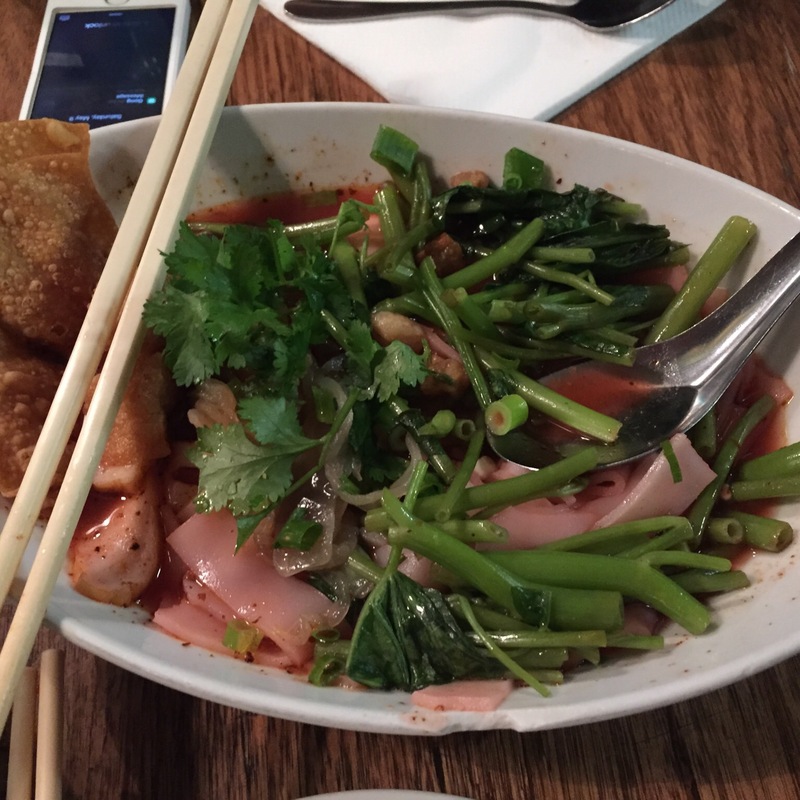 The kway teow was rehydrated from the dried version, but I could not complain in Sydney. It was as good as it gets given the lack of local ingredients. Kanom Jean Nahm Ya Pa, or Northern style bee hoon in a spiced tomato broth with pork ribs, chicken feet and blood pudding, was not for the newly initiated, especially for the blood pudding. We cannot get this blood pudding since the last abattoir closed down in Singapore, and I was surprised you can get it in Sydney. Served with a generous portion of kangkong, it was a very good street food favourite that found its way into the menu. Splendid. This is not a place for a romantic date, but a great supper or snack after the theatres or a proper dinner place. Too many things were going on at the same time, and you cannot have a good conversation without raising your voice. The trick was to finish the meal quickly and give up your places to another party, and then adjourned to the nearby cafes and bars for the tête-à-tête. I swept the glass off another table from the tail of my coat, that was how tight the space was in the restaurant. And be prepared to smell like the food if you sat indoors. The service staff was friendly and explained the food slowly and clearly. But don’t expect attentive service your orders were put in as the crowd was coming in droves and your position in the minds of the service staff got back a few places as time went by. Reservations recommended. Else be prepared to wait outside. Parking is a nightmare, so park further away and walk. You need that after a heavy dinner anyway.